My skin is all shivery after reading about your wooden spoons! And it keeps going all goosebumpy (in an unpleasant way) each time I think about it. Eeeeeeeek. Stop it! I'll play along!! I'm in such deap despair over the International Market news that I needed a good writing prompt today. ...and I hope your back feels better today!!!!! So funny about the wooden spoon...I agree about the spoons that come with the ice cream...they can cause the shivers! I can relate to the "internal talking". When I get excited about something new my brain will not shut off at night! It is just aweful. I am SO with you on the wooden spoons!Even thinking about that gives me the shivers! My inner voices are telling your inner voices to come check me out - assingment done! This telepathy thing is so cool. thanks for playing along....i got all shivery when you talked about wooden spoons....blah! Hope you are feeling better. I loved the Week in the Life project. Still giggling at Leif covered in yogurt (or ice cream?). He is hilarious! I completely agree about Wuthering Heights. It took me ten to figure out what the idea of the book was. I also thought that there was something wrong with me that I didn't like it considering it is a "classic." I hope that you feel better. Thanks for tagging me! I did it right away and it was fun! Kindred spirits on so many levels... (1-4), i love learning little details about people this way (even though meme's as a general rule make me cringe). so right about the wooden spoon thing. They are not allowed in my kitchen!!! And i thought i was the only one grateful when Ben and Jerry's started using plastic spoons for taste testing in their ice cream shops! 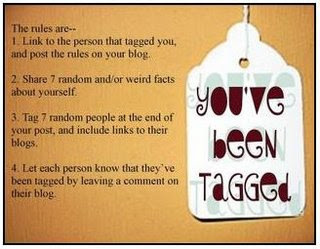 Thanks for the tag Heidi. I'm going to have to put that off for a little bit. We're still working the bugs out of homeschooling...lol! Wooden spoons...I literally have goosebumps!